Need to pick a name? The ‘Family Names of the United Kingdom Project’ has 320,000 surnames in use in Britain going back to the 11th century. The study has a wide focus, including not only names of English and Scots origin but also names of Irish, Gaelic, Welsh, and Cornish origin as well as Huguenot and Jewish. Special procedures are being developed for studying recent immigrant names (i.e. those appearing after 1881) such as Indian, Chinese and a range of Muslim names, with the cooperation of overseas consultants. 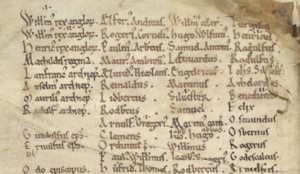 Using published and unpublished resources dating from the 11th century onwards, a team of researchers with expertise in historical linguistics and onomastics are collecting information about individual names such as when and where they were recorded and how they have been spelled. This information is being used to give new and detailed explanations of those names, adding knowledge which will be far more reliable and up to date than that found in the books on surnames currently available. Check it out, you might be inspired.